We are extremely proud to be a Church school with a strong distinctiveness in this area. Our mission statement is firmly rooted in our school life. Daily worship and our Gospel Values help us to fulfil our mission in following in the footsteps of Jesus Christ. Here are our school RE and Collective Worship policies. We follow the Blackburn Diocese Board of Education Religious Education syllabus for Church Schools. Here are the RE curriculum overviews. As a Church School, and in addition to OFSTED we are inspected under the 'Statutory Inspection of Anglican and Methodist Schools.' (SIAMS) On Thursday 10th November, we were inspected and are delighted to announce that we were found to be 'outstanding' across all areas. Please see the 'Our School' section of the website to view the full report. Our children are surrounded by opportunities that encourage and develop prayer, contemplation and reflection - a climate for asking questions, searching for answers and possibilities. These photographs celebrate some of these 'awe and wonder' places in school. Recently, some of our Key Stage 2 children were excited to discuss such experiences. "What would you ask God?" Would you always care about us, even if we didn't care for you?" Why isn't life so perfect? "What would you describe God as?" Some thought provoking reflections by our children, supporting their depth of awareness of their world, themselves and God. We are proud to have a strong partnership between our school and St. Leonard's church. Throughout the school year we attend church to celebrate and give thanks. Today our Year 1 children led our worship all about Harvest. We wanted to share their prayers with you. Today we say thank you for all the people, right across the world, who grow our food. We give thanks for the farmers, who grow our food. For the seeds that grow and turn into plants. For the rain that waters them, and for the sunshine that ripens them. We thank you for our daily bread and for all those who work to bring it to our tables. We give thanks for the harvest of the fields. We give thanks for all those who work so hard to gather this food for us. We think of those who do not have much food and who sometimes have no water to drink. Be with us all this day and always and keep us in your loving care. Our children enjoy singing hymns together in worship and hymn practice.
" The way we all sing together makes us feel really happy." You can listen to our children singing a selection of hymns below. We hope their beautiful singing makes you feel happy too! 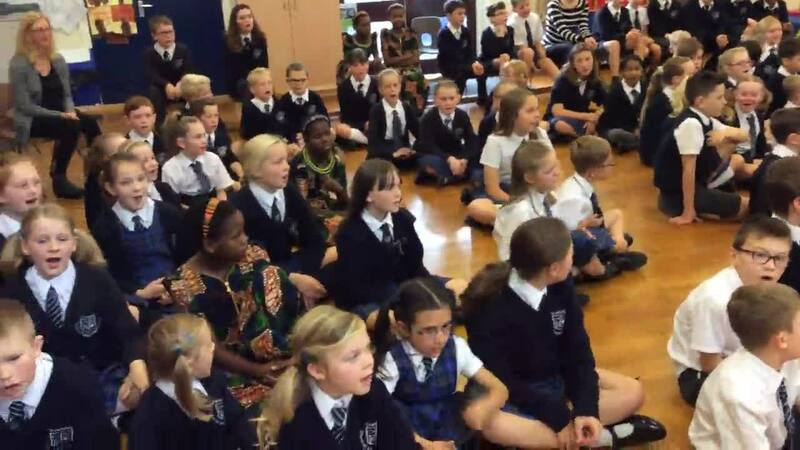 On Monday 24 October 2016, for the start of Christianity Around The World Week in school, a group of Year 6 children lead our school worship. They researched and compared the percentage of population who are Christians in England, USA and Mexico and used role play to present their findings. We were also shown a short video about the valuable work of the charity, Christian Aid. They also read the bible story of 'Daniel and the Lion'. Thank you to these children for leading a fabulous worship. She talked to the children about our new Gospel Value of Hope and the children thought of Bible stories where hope could be found. They were given the opportunity to consider their own hopes. They wrote these down on paper and then folded them. After placing the pieces of paper into water, the children then looked to see how their hopes had begun to open, supporting their initial understanding of this value. Thank you to Reverend Tracy for leading our Godzone worship. At the top of our RE page you can see photographs of our school and the enriching spiritual and reflective environment we provide for our children. Below are some new photographs to show our commitment to producing high quality learning opportunities and experiences for all who belong to our St. Leonard's family. Today we welcomed Mr Simpson to school. He taught us a great deal abut Christingles, what they are and what they represent. Have a look at our photographs of the learning we took part in. Our Gospel values since January have been Justice and Compassion. The slideshow below shows these values being promoted throughout our school. We strive to promote our Gospel values not only within school, but living these values in the wider community, each day of our lives. 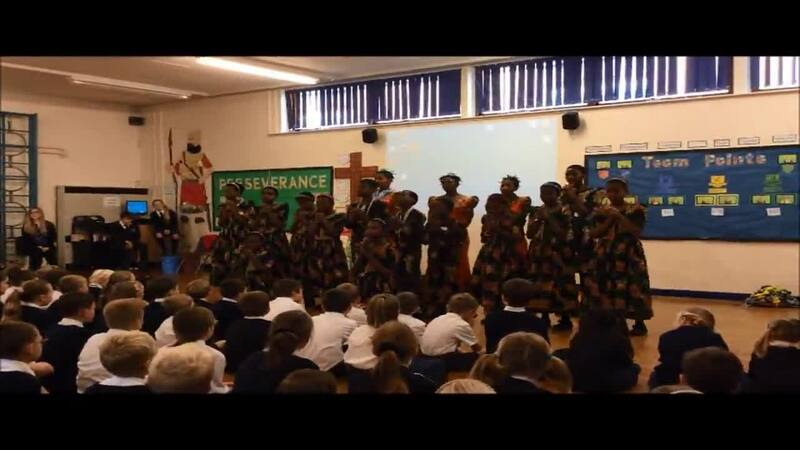 It is extremely rewarding to know that we have a team of children who are able to regularly lead whole school worship. They clearly demonstrate their understanding. This particular slideshow was about Corpus Christi. One of our youngest members of our school family was able to explain why we have three candles to light. God the Father, God the Son and God and Holy Spirit. The children's worships contain Bible readings, information, questions, presentations, hymns of praise and prayers. Well done to all our children who both lead and contribute to our daily worship. Following our Outstanding SIAMS inspection, we wanted to heighten our children's understanding of spirituality and what this means. Staff planned a range of exciting learning opportunities around this. We were keen to look at the impact of the week and so asked the children for their thoughts before and after the week. Having lots of big hugs with mummy and daddy. It makes me think about Jesus, how he died. It nukes me think about the Holy Spirit who guides us when we need help. It makes me think about how God made the world. It makes me feel happy in my heart. God the Father, Jesus the Son and my friends. It makes me think about the fancily of God, Jesus, God and the Holy Spirit. Trinity, it’s about the Holy Spirit. The spirit family is everyone. Spirituality makes me think about God the Father who made the world and God the Son who died for us. Spirituality makes me think that the Holy Spirit is all around us like God and Jesus. I like singing songs in worship and I like art and music too. I like nature in the world as well. Being with my friends and helping one another. When |I hear the word spirituality I think about God and Jesus. It makes me think about moments I have been through. I think about happy memories. It also makes me think about the Holy Spirit. How much I have and all I need is love and family and to make sure I show respect and do all of our school’s Gospel values. Being kind to one another and sitting in silence and peace. Different religions and God and Jesus and that we are so lucky to be here with a wonderful school and lovely houses and three meals a day. God, nature and who I am. My friends, family and Jesus and our great teachers. Do you have any questions about spirituality? How do people go to Heaven when they die? How can you be really spiritual to other people? Why did the Holy Spirit come down to Earth? What did the Holy Spirit do to the world? Why do we have spirituality week in school? What is spirituality mostly about? Why do we need spirituality? What is my spirituality inside my body? I want to know the true meaning of spirituality for me. Does Allah have the same meaning as God? Why does spirituality not be a time of year where we take a moment to think of all the good times we have had? From the range of responses, it was clear to see the children’s developing thoughts as they become older. The questions and responses were poignant and many were addressed as part of spirituality week to help teachers in their planning and delivery of learning. The impact on the school’s learning environment is demonstrated vibrantly within classes, along corridors and halls and permeates through all that surrounds our children. The contents of the displays are uplifting and demonstrate how we involve and challenge our children with the big questions that matter to people and which support our children’s place in society. A lot of what is seen around school shows children’s understanding of how fortunate they are and this reflects their thoughts on spirituality. They demonstrate a close link with well-being which has informed some of their thinking and responses. The children’s responses are very real; they come from the outstanding Christian education that St. Leonard’s provides. Additional experiences, e.g. Reverend Tracy’s spirituality game that some of children benefited from during spirituality week supported the children’s initial thoughts on what spirituality meant to individuals. To help measure the impact of spirituality week the same group of children were asked the following questions at the end of the week. Helping someone who is hurt. Me and my brother being kind, liking each other. Loving you in your heart. Spirituality means to me – enjoying, kindness, generosity, love, helping, sharing, caring, giving and listening to people. My friends and my friendship mean more than anything to me. My world is special to me. It gives e tine to think about God and Jesus. It makes me feel relaxed and sleepy. It means you are calm and still. It means a wonderful world. We have been thinking about the colours of the world. Spirituality is something that makes you feel happy and calm. Thinking of God and Jesus and showing respect. It reminds me of my hobbies. It reminds me of the Holy Spirit. Spirituality is what you have got inside of you, like if you believe in God then that’s part if your spirituality. Spirituality is also what you like doing, it is also thinking about what is inside of you and living – having time the way you like it. It means self-control and thinking about the future. Being kind to all people, whether they hate me or aren’t nice to me. Connecting with the world around me. When I’m on the beach and it’s a sunny day and it’s peaceful and all you can hear are the birds singing. Hope, generosity and everybody being friends and happy. Do you have any other questions you would like to continue thinking about in your religious Education learning? How we love and care for each other. Yes, is there anymore things about spirituality that I need to know and what does spirituality mean for everyone? I would like to learn more about how God made the world. Do you need to wear any clothes or eat anything to be spiritual? I would like to learn lots more about spirituality. Do all people have spirituality? Is spirituality something you have for the rest of your life? Is spirituality a natural thing? How was the Bible translated around the world and into different languages? Why is spirituality called spirituality? It is clear to see the impact Spirituality week has made in school for our young learners. It would appear that our children are so well versed through our embedded Gospel values and these clearly impact on their ability to attach ideas about spirituality to themselves and their lives. Later on in the academic year we plan to bring together our teaching and learning surrounding spirituality, world faiths and Christianity around the World into a specially planned week, enriching experiences through art, music, dance and cookery. Please see across this page for a gallery of celebratory photographs from the week. We believe that excellence in RE is supported by providing reflective opportunities between teachers and pupils. Below is a slideshow displaying the opinions and understanding shared by some of our Year 6 children, during one of our pupil conferencing sessions. Over the coming weeks, we will be speaking to our younger pupils and sharing their thoughts on this page so please keep checking for more slideshows. Look at our amazing learning environment. Our prayers and thoughts from Harvest and our remembrance reflections. 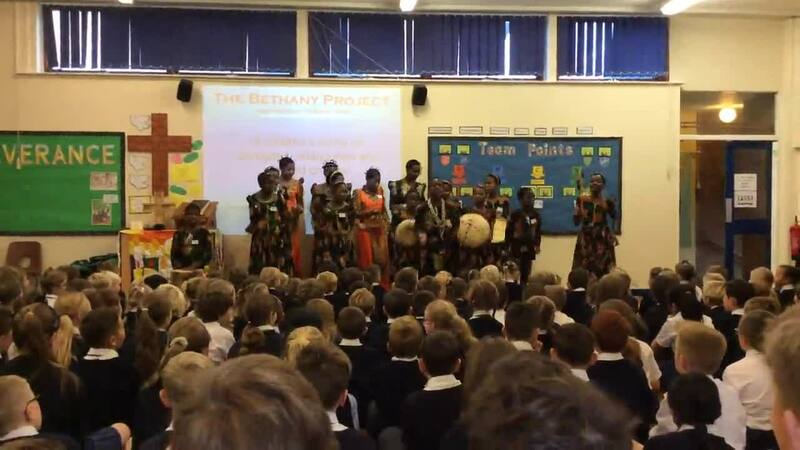 On Tuesday, of Christianity Around The World Week, we were blessed to have the Bethany Family Children's Choir visit us, all the way from Tanzania. These children belong to one big Christian family who live together in the children's home built and supported by the Bethany Family charity. The charity helps the most underprivileged, deprived and vulnerable members of society, especially orphaned children. Many of the children who visited our school wouldn't be here today had Bethany not been there to care for them. Teachers and children alike were humbled to hear about the tragic events that had brought them to the children's home. 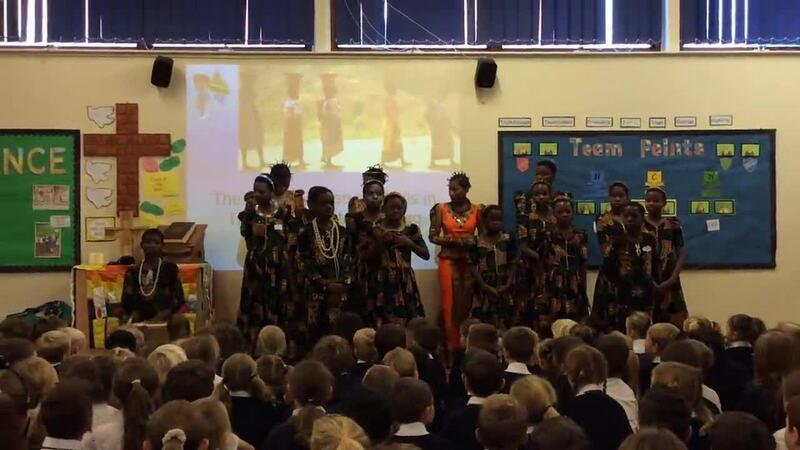 Children from Years 2, 4, 5 and 6 had the opportunity to talk with the choir about their daily lives back in Tanzania. Talking to our children afterwards, it was clear they had a greater awareness of the cultural differences, poverty and lack of opportunity that exists in Tanzania. Many of them realising that they take for granted their comfortable lives in England. 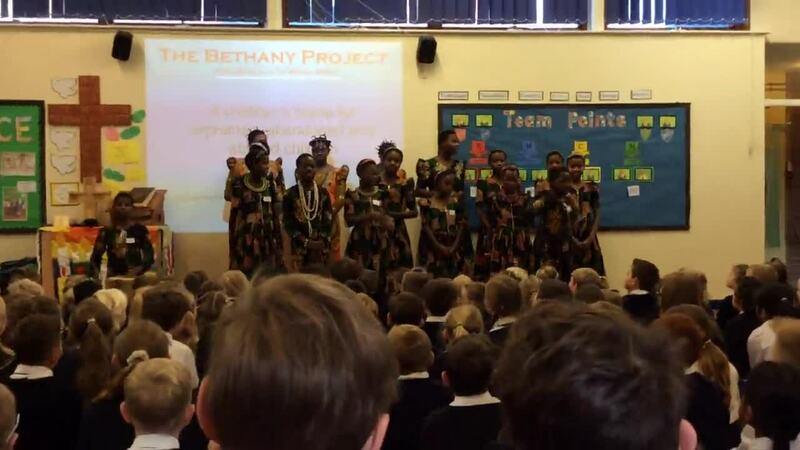 The Bethany Children's positive Christian perspective on life, displayed with such passion through their beautiful hymn singing, will be a lasting memory for everyone who had the honour of meeting them at St Leonard's. Watch the Bethany Children's Choir. We sang one of our favourite hymns as a thank you to the Bethany Children's Choir for visiting us. You can learn more about the Bethany Family and how you can support the vital work they do by following the link below. Celebrating St. Leonard at St. Leonard's! Today Year 3 led our whole school worship in Church. The children spoke so clearly and with firm understanding of St. Leonard and other saints. The children were keen to ask questions and respond to their friends' answers and comments. Being able to teach one another and share their knowledge was particularity inspiring. The children wrote their own prayers. Here they are for you to share. We are very fortunate to have such wonderful grounds in which to enrich the lives of our children through outdoor learning. Sharing our Christian values and attitudes and supporting spirituality is at the heart of what we do. Please take a look at our gallery below. Thank you to our Year 5 children who led our worship in Church today. Much time and research had taken place in order to teach us not only about why we have Remembrance Day but also about those who had fought and lost their lives from our Parish. The children delivered a very poignant and thought provoking service. Their understanding was clear through the sensitivity shown and prayers that were shared. As our term draws to a close, we have been extremely busy in school. Our Reception and Year 2 children performed their Nativities in Church and were absolutely amazing. They really touched us with the true meaning of Christmas and what Christmas means around the world. Year 6 led worship too, they gave us a brilliant insight into Christmas and their musical and acting talents were incredible. Our School Choir sang beautifully this week during our Church service, we have such talented singers. We would like to take this opportunity to wish you all a very hopeful, happy and peaceful Christmas. With very best wishes from the St. Leonard's school family. Today (25.4.17) our Reception children taught us all about St. George. They told us all about the patron Saint of England and shared his story with us. Help us to be brave and strong like St. George as we travel along each day. Amen. Well done to our youngest school family members. You taught us more about our Gospel value of thankfulness, with a new song from fischy music. Please click on the link below to see the worship details. We have been thinking about the new year and how we sometimes make changes at the start of a new year, with new hopes. We have thought about how we can make a new start with God at any time - we never have to wait until a new year. We have 'turned over a new leaf' and written our thoughts and prayers on them. Here is a selection of them.